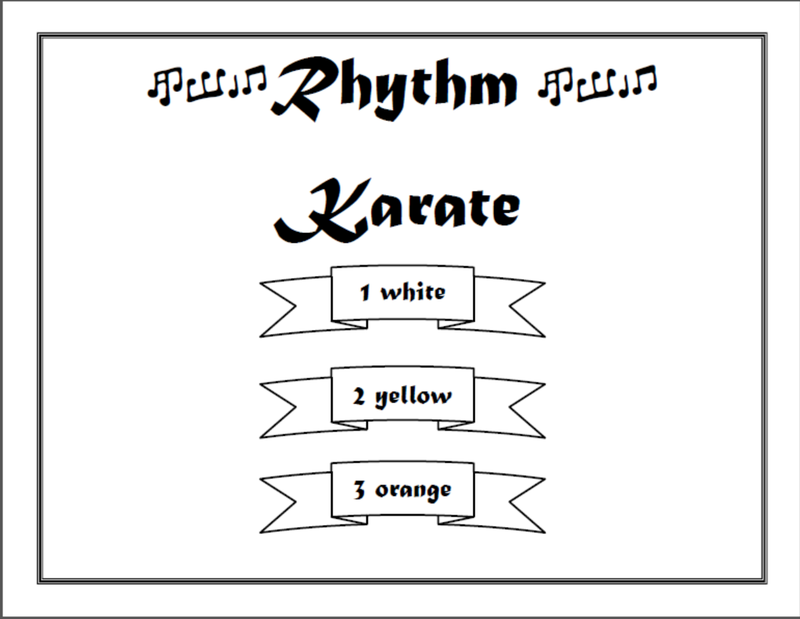 Rhythm Karate – FREE Download! Last year around this time of year I looked up at the clock and noticed that my 2nd graders had finished our entire lesson, AND played several of my best games AND we STILL had 10 minutes left!!!! … I’ll admit that I wasn’t feeling particularly inspired, but I wanted to try my best to review known concepts because being May, I knew that I would only see my kiddos a couple more times…. AND I wanted to have fun because once again, being May I knew that nothing less than fun would be motivational for my students. So across the room I spied my set of handy dandy color coordinated rhythm flashcards. At this school I have the ones created by Denise Gange. They can be purchased HERE! I looked at the clock one more time and I said, “Let’s play Rhythm Karate!” Even as I said it, I was remembering the fantastic motivation that happens with Music K-8 Recorder Karate and doing some quick thinking about how to turn my borrowed idea into a fun whole group review of rhythm on the fly…. and what about belts? I didn’t have any! YIKES! I asked my students to look the first card over and figure out how they would read it, play it and say it…. Then the entire class played and said the first card…. and the second…. until we reached the end of the first color… If the performance was sloppy, we repeated it and cleaned it up…. If a rhythm was unfamiliar, I would pause and ask questions until the students could teach each other how to perform the rhythm… As the cards flew by the students got more and more excited and more focused, Because effort and focus was high, even my students who would ordinarily be left behind were keeping up… Once a color was completed, we cheered and I wrote down on their seating chart that they had earned their white belt… that’s it! I just told them, “You’ve just earned your white belt!” “Hooray!” At which point they were SOOOOO excited that they literally BEGGED to earn another belt right then! Did I mention that they were excited? No physical belts required! If time allowed, we would do a couple of cards from the next belt and then I’d notate on their seating chart the number of the card where they left off…. easy as pie! The students were so excited about it that I tried it again the next day and my partner teacher next door tried it and loved it! Everyone was on task, everyone was excited and everyone was able to progress at a good pace through the cards. This year we decided to include the activity in our lesson plans for 1st, 2nd and 3rd grade… Because of natural mobility, we decided it might be best to start on the first set of cards regardless of grade level. This is great because it gives some of my struggling students the confidence early on because as the colors change the cards get progressively harder…. Starting from the beginning also helps correct lazy and thoughtless habits of students who really have it but need to practice precision. Additionally, when you have a class that doesn’t immediately fall under the “karate spell” (I have one out of 12 classes) adding unpitched percussion is awesome! 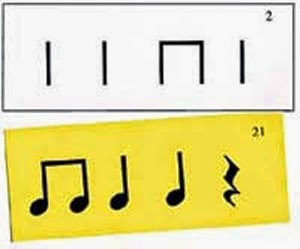 You will want to have a plan for rhythms that contain notes with longer duration like half notes… How do you want those notes played? However with a plan in place, it is a great strategy because the karate mindset promotes personal discipline which means that poor instrumental technique can cause a class to have to perform the flash card a second or third time. No more sloppy practice! We also started posting the belts earned on our board. I put a class name and then the belt earned next to it…. They enjoy the posting of results so much that my older students are asking when it will be their turn to play. I have also created a certificate that classes can post on their doors that will declare which belts they have earned. This is a GREAT end of the year review activity! I hope you enjoy! Download the certificates for FREE! below!